Kingswood Oxford varsity basketball standout guard Nick Bray '19 wrapped up his Wyvern career as a 1,000-point scorer. Bray hit the milestone earlier in the season in a win over Kent in the KIT Tournament. “It was one of my goals coming into the season to reach that milestone and accomplishing it felt great,” Bray said. Bray leaves the Kingswood Oxford boys basketball team as a player that had a major part in the program’s resurgence. 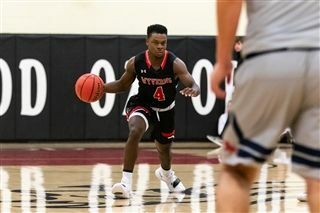 The Wyverns made the NEPSAC Class B semifinals his sophomore season and were playoff contenders each of the last two years. “What stands out to me is even though we only made playoffs one year, the last three years we had all winning records and that is what stands out to me the most,” Bray said. Bray is weighing his options for after graduation and a post grad year is likely in his future. But wherever he ends up, Bray will go leaving the KO basketball program in good shape.